Len made a real splash in the F1 Stock Car scene when he arrived with brother Henry in 1972, with his ‘take no prisoners’ driving style. Already a terrace favourite, the occasional final win saw him hovering around the top of the blue grades for a few years. 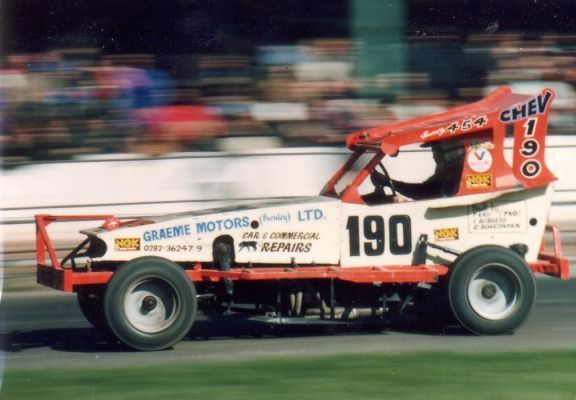 A cost-cutting move to F2 in the late 70s followed, before the offer of Frankie Wainman’s spare car seduced him back to the big league. The ‘Wild Wolf’ was so much more than just a wild card on the track; now with the 212 machine beneath him, he was a revelation, moving quickly to SuperStar. He finally built his first car for the 1980 season and the following season, it took him all the way to the top with a World Final win. Financial pressures once again restricted his racing, but another offer of a spare car – this time from Mike Close – saw Len back at the top, concentrating on World Qualifiers. Consecutive second places in the big one in 1984 and 1985 proved him to be a match for anyone on his day. Always outspoken, he had ‘issues’ with probably everyone in the sport at some time or other, but he was always a fans’ favourite – a true character. Further Photographs of Len Wolfenden can be found on Brian Watson’s excellent website Ovalaction.com – Click HERE to be taken direct to Len Wolfenden’s page.